Last time i shown you how to apply facebook style or theme to your default facebook account .In today post i will show how to misuse some facebook feature to send unlimited message on facebook to unknown.Facebook is most popular social networking website ,some people are always try to find out loop holes in it , so people found a new loop hole in facebook or we can said that , we can misuse a feature of facebook to send a message to any unknown without getting any warning or account disabled from the facebook.So this loop hole help to those people who always send spam message to unknown people to make them friends,But if you send excess message to unknown people ,your account will be temporarily restricted to send any message and friends request to the unknown peoples.But using this feature you can send unlimited free message to any one.The most good thing about this loop hole is that your message directly delivered to the unknown user main folder instead of other folder .See below image how it look when facebook disable your function to send more message to unknown. 1.) Click on wrench icon beside message and then click on report/block ,See below image. 2.) 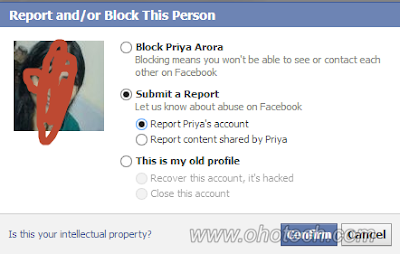 Then Choose Submit a report and then again choose report profile name account and finally click on the confirm . 3.) After the above you will get some set options out of that option choose the above option of The timeline is using fake name. 4.) In the final step you will get a window to enter text message ,enter your message and then finally choose the Continue ,see below image. That’s it now your message send to unknown person main folder instead of the other folder and using this loop hole you facebook account never be blocked or disabled ,look below pic how message will look like after it delivered to other persons. You can also look at my other post like some new features of facebook that facebook recently launch like facebook open graph search and how to set and manage admin roles for your facebook page .. I hope you like my this post don’t forget to subscribe my blog and if you have any query leave comments. 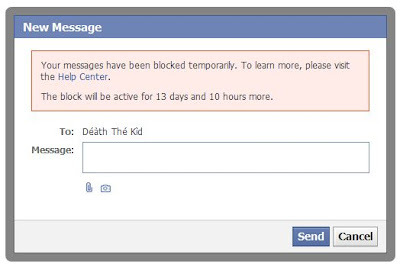 Hey I have tried this trick on facebook today, and even though it helped me get a few messages through, it still said that If I continue it I will get blocked. I think they may have changed the design and loophole. Do you know if there is another way to do it? Ok, thanks for getting back to me. Yeah, i will also try to search and see if anyone knows the new way to do it, but if you do find out the other way, just let me know. I tried sending message to friend using trick report/block this time time line is using fake name but message gone to other folder instead of main folder.